"straight-forward, provocative, and insightful book." The so-called “Anbar Awakening” in 2006–2007 in which Iraqi Sunni tribesmen rose up to fight Al Qaeda in Iraq (AQI) with the aid of American soldiers and Marines is touted as the one indisputable success of America’s long and complicated military adventure in Iraq. Combined with the “surge” of American forces into Iraq in 2007–2008, this campaign to wrest Iraq’s largest province back from a bloody insurgency became a critical component in reducing the violence in Iraq and allowing U.S. forces to draw down and eventually withdraw from Iraq. However, less than three years after the last U.S. troops left, Iraq was once again swept by a Sunni insurgency, this time flying the black flag of the Islamic State. How did the situation tank so quickly? Why did the once relatively pacified province held up as a model of a successful counter-insurgency become the scene of carnage again as Iraq government forces slowly pushed ISIS forces out of cities once taken and held with American sacrifice? These are difficult questions that Carter Malkasian tackles in this straight-forward, provocative, and insightful book. Both an academic and an experienced practitioner of counter-insurgency or COIN operations, he brings a unique insight from his actual experience on the ground in both Iraq and Afghanistan as well as authoring a case study of COIN operations in the 20th century. Malkasian looks at the Anbar Awakening not primarily through a military focus, rather he analyzes the political implications of every military action taken by the United States, the Iraqi government, and the Sunni tribes. Remembering Clausewitz’ admonition that war is primarily a political act, he notes that several non-military factors ultimately undermined the real but fleeting military success by American forces. First, although the Awakening was successful in reducing the threat and violence by AQI, only long term political reconciliation of the Sunni population that dominated the province could cement the military gains. Unfortunately, the sectarian nature of Iraqi politics meant the Shia Muslim majority was never going to truly share power with Sunni Muslim minority tribesmen that were armed and trained by the United States, which many Shia politicians considered only a slightly smaller threat than Al Qaeda. Unfortunately, when the U.S. withdrew their last combat troops, including advisors and sponsors to the Sunni tribes, these sectarian tensions ratcheted up to levels that allowed the Islamic State to return. Second, the Arab Awakening and subsequent civil war in Syria provided an incubator for ISIS, which as Malkasian shows via a compelling analysis, was really just the remains of AQI that went dormant after the surge, maintaining a presence in Anbar and waiting for an opportunity to reassert their dominance over the Sunni population. Once the Shia government started to fan sectarian tensions and began military action against the Sunni tribes, it was almost inevitable that ISIS would again present themselves, as AQI had tried to do, as the protectors of the Sunni people against their Shia oppressors. Utilizing their stronghold in western Syria as a base to launch their offensive into Iraq, ISIS quickly overran most of Anbar and again asserted dominance over the Sunni population, many of whom now supported ISIS against what they considered a Shia dominated government. Finally, the tribal politics of Anbar were never really understood by the American military, and here the author really does a great job of explaining the complicated nature of Iraqi tribes, sub-tribes, personalities, and politics and how this complicated brew ultimately sowed the seeds for the rise of ISIS by overturning traditional tribal structures in the aftermath of the Anbar Awakening. Malkasian does a marvelous job of weaving these three factors together with the actions of the many American generals and colonels who tried so hard to secure this province into a clear dissertation on the military hazards of trying to wage a COIN campaign within a complex web of tribal, sectarian, and cultural relationships. The sudden collapse of the Iraqi Army and the need for U.S. forces to return to Iraq and reconquer cities like Ramadi and Fallujah where so many American troops died is a tragic reminder of the hazards of military actions that upend political structures with no clear plan to put them back together. This is a difficult but necessary book to read. 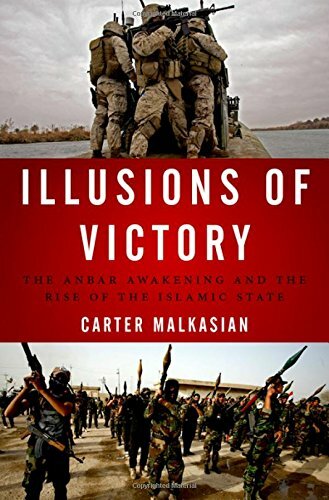 Malkasian pokes numerous holes in the narrative of the success of the Anbar Awakening and the Surge, but his conclusions are tough to dispute. By putting the events of 2006–2007 into the full context of Iraqi events to date, it adds a more complete picture of the Iraq War.